Sweet nostalgia… dresses, tunics and trousers are like from a children’s book, but most of all they are: timeless. 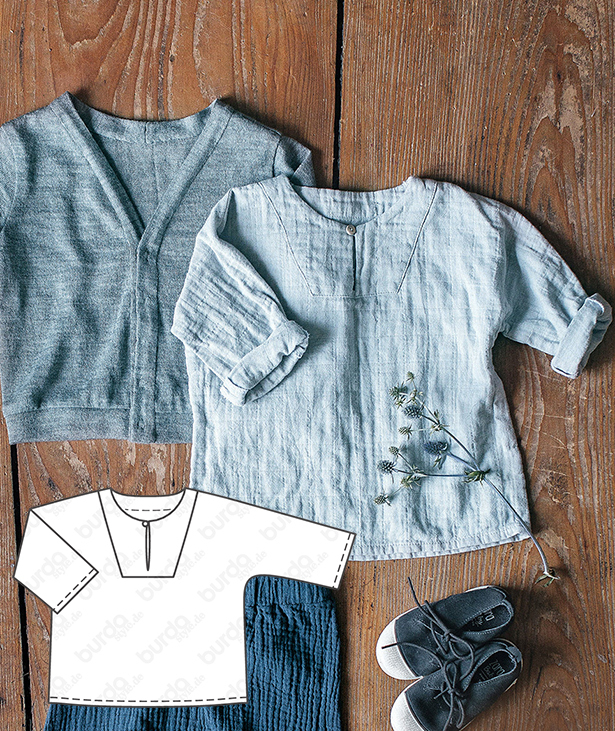 These styles from the 02/2019 issue of BurdaStyle magazine are punctuated by simple, beautiful colors and fabrics that transcend time. All kids are sure to find these a favorite because it would be hard to find anything else so splendidly comfortable. 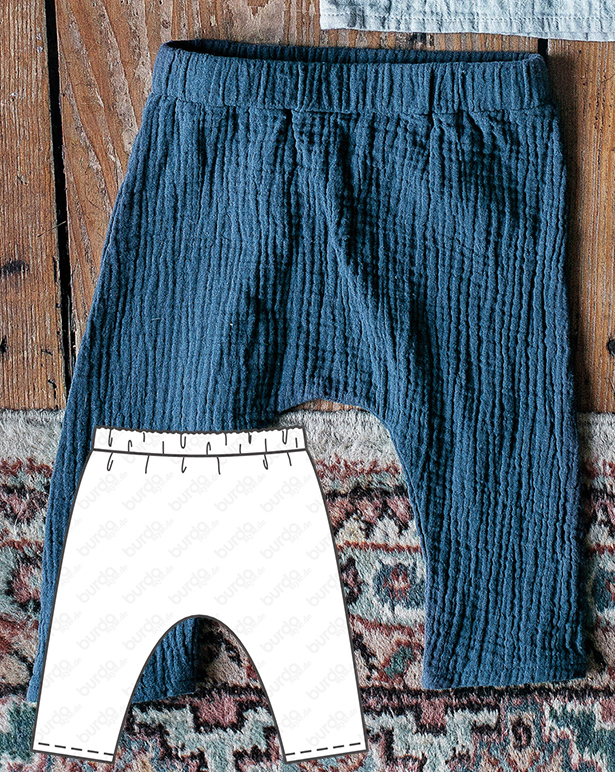 The double gauze trousers are super quick to sew. They make a great gift for mums with new babies! Come on, let’s go shopping (play time)! Simply pull on this cardigan with the ribbing over top, tuck some money in the side pockets and snap it closed in front – all by themself. Suddenly, the youngsters are looking very grown up. At last no pink! 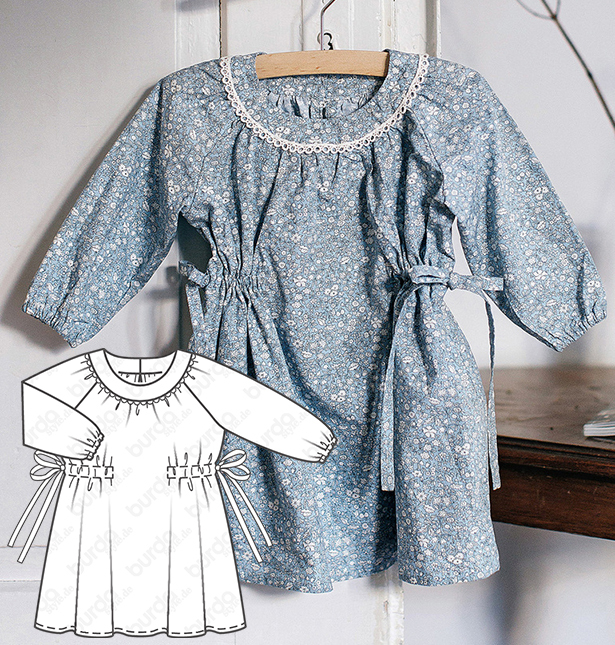 This dress sewn in a light blue is fun for celebrating – such as for a birthday. The fabric is enhanced at the neckline and the hem with decorative machine stitching. The style is one that also works well with printed fabrics. It is hard to handle how cute this look is. 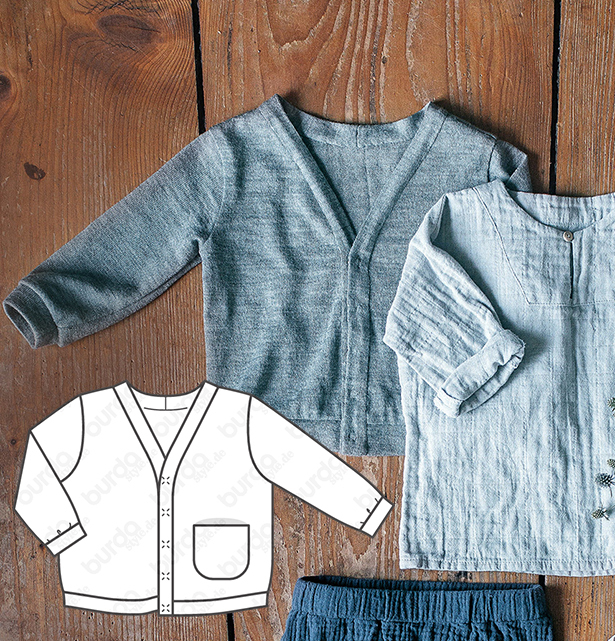 The relaxed style is ready for every adventurer, whether they are crawling or running. And, mamas will be happy to know that elastic keeps them easy to pull on and off. Grey, but hey! This style is a basic for boys and girls. The lightweight cardigan with snaps and ribbing at the sleeves and hem pulls on quickly (and always looks great). The mandatory pocket is placed in the left front. A beautiful style that can pass on to the next generation after a growth spurt. The vintage look floral dress includes drawstring casings to tie at the waist and a stitched-on lace trim at the neckline. Pair it with leggings or jeans worn underneath for tumbling around. We are in love with this retro tunic with its elastic smocking accents above the hem and at the sleeves. 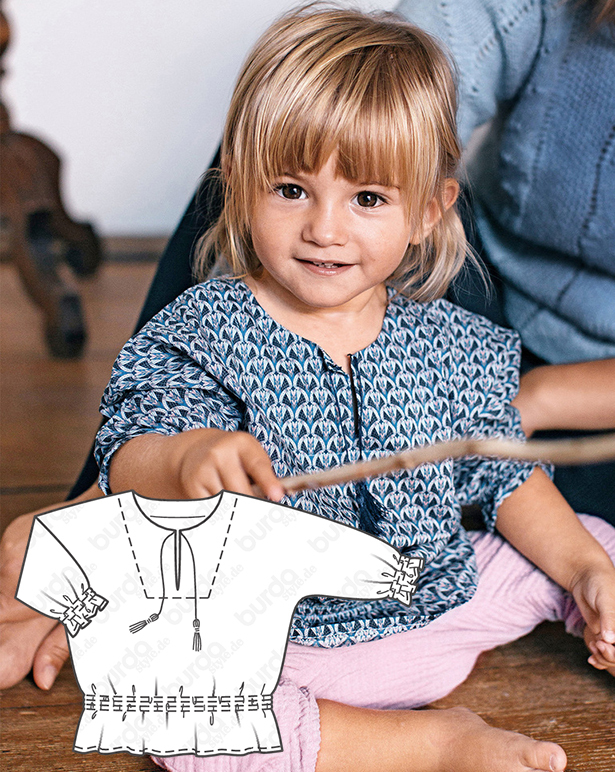 The neckline features a decorative cord with mini tassels. For extra-cold days, wear it with a wool silk bodysuit or a turtleneck combination. This top completes a fantastic unisex combination with the jacket and trousers. The casual shirt has sleeves that roll. 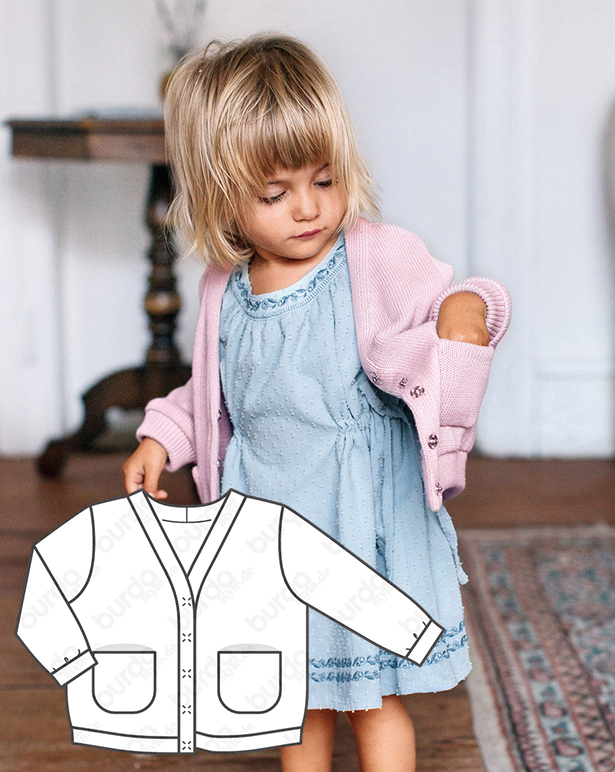 Sew up all these adorable styles with the discounted pattern collection bundle here! I would love to see these in the next set of sizes, say ages 3 – 6? They’re such a refreshing change from the typical kids clothes. More like these please!